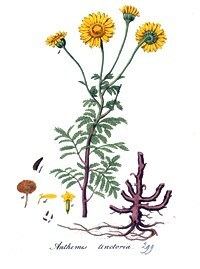 Anthemis tinctoria is a Short-lived perennial herb, 30-70 cm tall, colonial from creeping above-ground stems, flowering stems erect few-branched, hairy. Leaves alternate, pinnately divided, 2-6 cm long, midrib winged, segments toothed or divided, wooly below. Flower heads 3-4 cm wide, daisy-like, with 20-30 rays, disk about 1.5 cm wide, disk and ray flowers yellow, basal bracts small, dry, numerous. Habitat: Weedy open areas, roadsides.